The Children’s Aid Society of Haldimand and Norfolk thank all those individuals and organizations in the community who helped children and families over Christmas. Your efforts and contributions helped hundreds of children and families in Haldimand and Norfolk. It is important to note that the Children’s Aid Society of Haldimand and Norfolk offers services and programs that are not under our mandate. Such services require support from the community. This year help send disadvantaged children and youth to camp, help them participate in recreational activities and get an ongoing education. 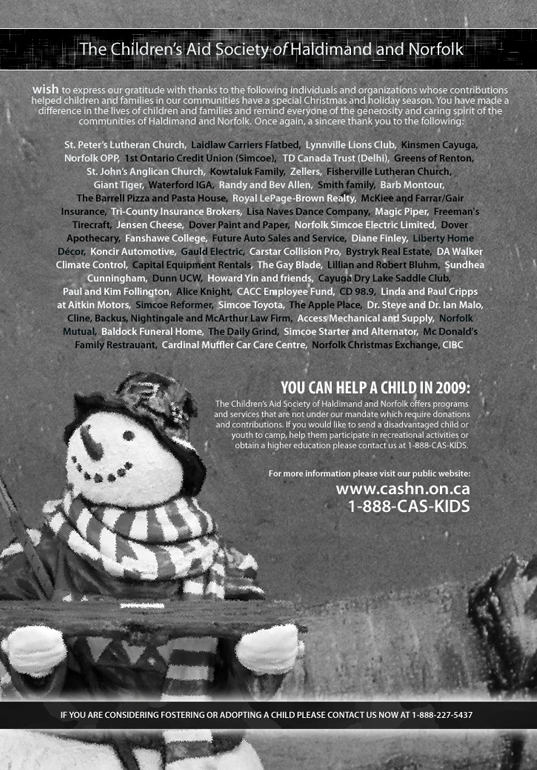 Please contact us at 1-888-CAS-KIDS if you would like to make a charitable contribution to help a child or teen in your community.